There's no end to the puns I can make with the subject of this post. I'll pass on that temptation, though, to discuss my latest revelation, which came upon me while browsing Ravelry. 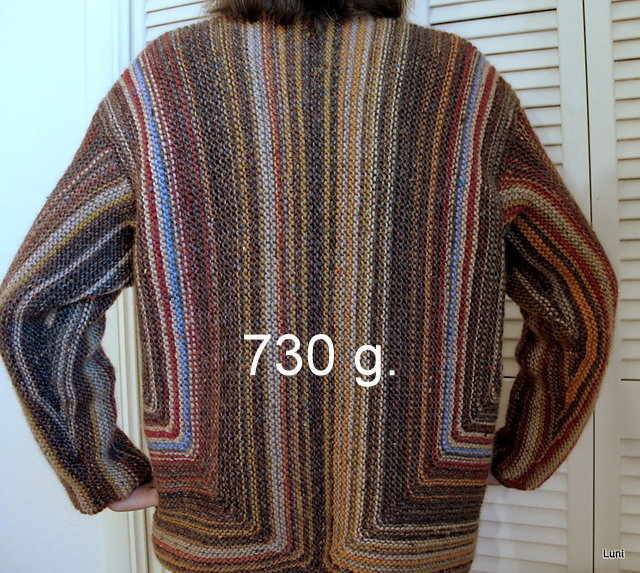 I saw a project page in which the knitter had posted the total weight of her sweater, as though proud of it. I had never thought of checking the weight of a finished sweater, but now I got my little scale out and began. I started with the ones I have on hand. As a disclaimer, I don't mean these to be a fashion show. Some of the sweaters are nearly 10 years old and none are what I consider a total success. Hopefully, as I study the information here, I can plan to knit sweaters that are more of a success. The links to my Ravelry project page for each of these are listed below. They are in the same order as the photos of each sweater, going from left to right of each row and starting at the top row. Straight Sleeved Cardi, 240 g., the lightest, less than half a pound. Raveling Leaves, 244 g., or a mere half of a pound. Eyelet Lace Pullover, 272 g. or .6 lbs. Marli Pulli, 318 grams, or .7 lbs. Effervescence, 366 g., or .8 lbs. Heart Attack, 366 g., or .8 lbs. Purple Cabana, 370 g., or .8 lbs. Bianca's Jacket, 384 g., or .85 lbs. Darker Rib Cardi, 388 g., or .86 lb. 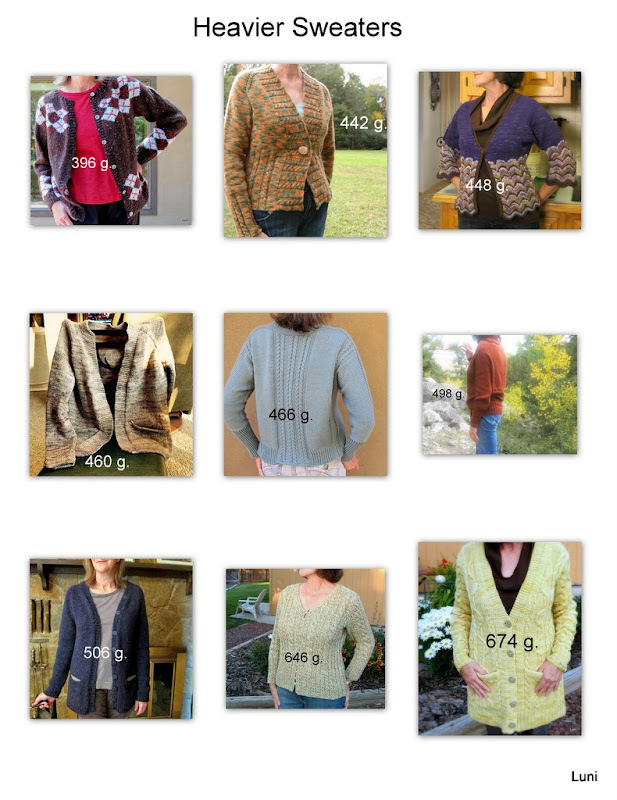 Of course, it is obvious that the sweaters in the group above are mostly shorter, sleeveless, or knit with something other than wool or alpaca. There's a couple of exceptions, but those are knit with lace weight yarn held double. The three in the middle row are the most comfortable of these. Since they land in the mid-range of the lighter sweaters, weight-wise, I am tempted to say that these sweaters, those between 300 and 400 grams in weight, are the most comfortable weight in this group. The ones on the top are a little too light--I'd just as soon wear a t-shirt as one of those. The ones in the bottom row are really too heavy for their construction, being either sleeveless or cropped. Argyle Star, 396 g., or .87 lbs. Green Jeans, 442 g., or about a pound. Ripple Cardi, 448 g., or about a pound. Definitely Me, 460 g., or about a pound. Educational, 466 grams, about a pound. Bubble Pullover, 498 g., or 1.1 lbs. PostGrad, 506 g., or 1.1 lbs. Kitty, 646 g., or 1.4 lbs. Pocket Cardi, 674 g., or 1.5 lbs. Southwest Mitered Jacket, 730 g., or 1.6 lbs. That's a heavy sweater! It's worsted-weight wool, garter stitch and oversize. Still, I wear it when it is cold in the house and we don't want to turn up the heat. I have one other sweater that may be even heavier. It is cabled worsted weight wool. I'll check the weight when I get it out of storage this fall. As might be guessed, I don't wear it often. After this project, and a couple of more heavy sweaters, I will have rid my stash of old heavy yarn. When I make my next sweater yarn purchase, I will consider total weight along with the usual other criteria. I'm eager to try some of the newer yarns that claim to be both warm and light.